All Hydraulically Driven, Only 2 Amps of 12/24 VDC. 800 CFM of Air Circulation. No Air Ducts Needed. Cab Pressurization and Outside Air Filtration. Cooling and Heating for Cabs up to 8' x 10'. Self Contained - No Remote Components. "Ask the man who runs one"
Our rooftop 24,000 BTU/hr. cooling and heating unit is an overhead mounted, unitary, or self-contained unit. Our vertical 24,000 BTU/hr. cooling and heating unit is a side mounted, unitary, or self-contained unit. MacBone air filters are designed to be mounted next to the MacBone rooftop or vertical unit. 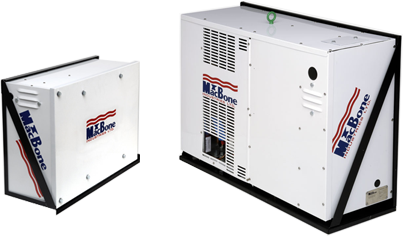 The MacBone P150 air filter and pressurizer assembly is designed to bolt directly to any MacBone rooftop unit. Parts can be purchased so that you can properly maintain your equipment.